I will bring a telescoping pool pole with wire brush to the Palm Springs in two weeks. I am so bummed! We were going to come out this weekend but we traded in our F150 ( and believe me that was a good thing) for an F350 and hubby doesn't want to take it into the Springs on it's maiden voyage! Ack! SO I will have to bring the supplies next time. To be clear, despite Lee burning my wood I’m happy he’s there. But just know wood left in the community area gets burned quickly by him. So keep it in your camp and bring it down for each evening if you want it to last. Let’s leave it at that and keep the camp needs thread on topic. It is his home. And he doesn't dump Burro poop in the community fire pit, he dumps it across the road in a big pile and then burns it after it gets so big. I know cuz I helped him rake it up. Which one of you is going to give up you creature comforts to live as a hermit in the middle of no where? I really cannot believe this convo is even happening. The Springs will be destroyed as soon as he leaves and all you can think about is getting to that point faster because he is a little different??? I don't care how long you have been on this forum. To plot ways to kick an old man out of his home because he is becoming a little more eccentric? I hope you never be perceived as having a problem and get plotted against behind your back. If you have a problem you need to work with Lee first. Not sneak around here planning his eviction. When you bring firewood - take photos and post them here. When you see the camp host burning wood take pictures and post 'em here. If you need firewood disassemble his fence and burn it. He often relocates donated firewood to his own pile. If you see the camp host dumping burro crap into community fire pit, take pics and post them here. 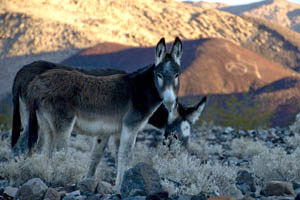 If you see the camp host letting burros onto the lawn, take some pics and post them here. Let's document his anti-social behavior and kick this guy prematurely. I am sure he helped many people but in recent years his behavior became antagonistic to visitors. If Lee is burnt out he needs to go now. There is no point to wait until he retires. I know it seems frustrating that he burns the wood but this is a guy that has basically lived out there for years. Taken care of both the springs and travelers who get stuck in the desert. He has his quirks but it takes a special kind of person to live like that. If it really bothers you that this man burns wood while he soaks in the afternoon then just don't bring any. As far as I am concerned he can burn what he likes. I am afraid when he leaves the Springs will change dramatically and burnt wood will be the least of out woes. I predict a change as to how long the wood pile lasts when the Lizard leaves in a couple of years. Second what JayOtheMountains said. Fire left in the community wood pile is rapidly burned by Lee. I made the mistake once of dropping my wood in the then empty community wood pile as I was going to make a fire there later that evening and cook my hot dogs over it. Lee burned it all during his afternoon soak. The following year there was a good stack in the community wood pile. Over half of it burned in just a few days with no one around as Lee had his soak. Massive bonfire each afternoon and then left unattended to burn down to coals. Don't waste your time doing a massive stock of the community wood pile. Keep wood in camp and bring it to the community pit as needed. I would shy away from asking folks to bring too much. If anything community firewood should be brought down the evening(s) you intend to use it. For, the camp host doesn't like to see a large pile of wood and tends to.... dispose of it when there is not ( and when there are ) people around. Coming to the Springs in Sept. Will bring supplies. Where is the storage exactly? I think I learn something new every time I go there. lol We have just been dropping TP in the bathrooms that need it. I will be happy to rotate. Just let me know where it is.